Our School Programs have been recognized by the NYS Cultural Education Department for adhering to the leading NYS standards and Common Core standards. Read our testimonials. Field Trip Grants are available to public schools in Dutchess and Ulster County through the Community Foundations of the Hudson Valley and Teaching the Hudson Valley. To participate in Pre-K - 12 School Programs, please contact our School Programming Coordinator at (845) 255-1660 ext. 118 or education@huguenotstreet.org. Homeschoolers, click here. For college student groups, click here and contact our Retail & Tourism Manager at (845) 255-1660 ext. 103 or by emailing tours@huguenotstreet.org. Introduction: Students receive an introduction to the Huguenots through a guided story telling of “Hugo the Huguenot,” a children’s book that describes the journey of the Huguenots starting in France and ending in their home in New Paltz, NY. 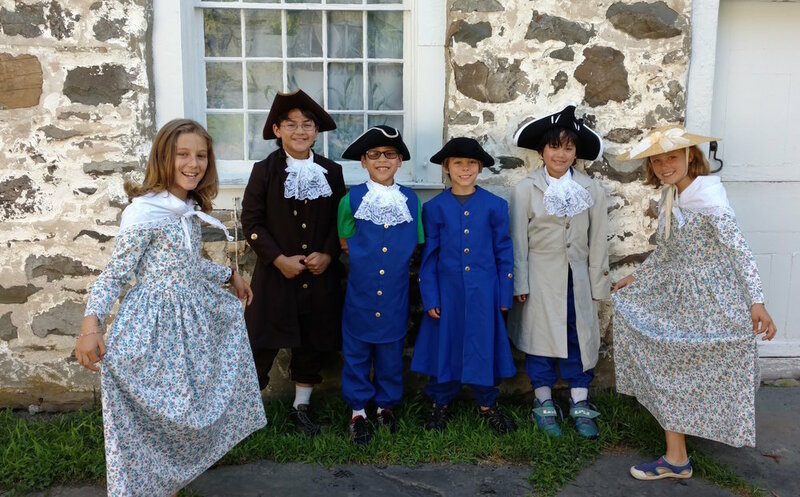 Jean Junior Detective Tour: A costumed interpreter will guide students through one of our stone houses from the 1700s to see what daily living was like. Students will be asked to become a “detective” and try to figure out who lived in the house and what each room was used for based on the “evidence” they see during their tour. Native American Craft: Students will discuss the Lenape people who lived in New Paltz long before the Huguenots arrived. The use of wampum will be discussed and children will have an opportunity to participate in a beading activity. They can take home their craft as a souvenir. *Adaptations and modifications are made for the needs of your class depending on age and ability. Colonial Dress Up and Games station: Students get the opportunity to dress as a boy or girl from the 1700s and to play a variety of games that were played by children during this time period. Investigation Station: This hands - on station offers students the opportunity to investigate and touch a variety of replica artifacts. Children have the chance to observe using all their senses and make inferences before they find out what each object is! Stone house tour: Students will be guided through one of our stone houses from the 1700s to see what daily living was like. They will be asked to compare and contrast their own life to that of a boy or girl during colonial times. Wigwam: Who were really the first people here on this land that we now call Huguenot Street? What did their homes look like? Where are they now? These questions and more will be answered as students get a closer look at our authentic replica wigwam. Stone House Tour: Students will get a peak into the lives of a family who lived in the house in the 1760’s. As they tour this old stone house, with a costumed guide, they will see what daily life was like and be asked to compare and contrast it to their own lives. Colonial Games & Dress Up: Students get a chance dress up as a kid from the 1700’s and learn how to play games from the time period. They will be asked to reflect about the similarities and differences between games then and now. Quill Writing: Students learn a bit about the history of writing implements for school children and get to try their hand at writing with a quill pen. They will take home their piece of writing as a souvenir! Introductory video: This video gives an introduction to the Huguenots and why they came to New Paltz. Wigwam: Students are invited inside our replica wigwam to discuss the Esopus people who lived on this land long before the Huguenots came to New Paltz. Here they will discuss how a wigwam is built and the daily life and practices of the Natives Americans. Stone house tours: Students will be transported back in time as they tour two different stone houses to see what life was like for the families that lived here during colonial times and for the enslaved people who served them. French Church Burial Ground: Students will gain information about origins of the name of the cemetery and of different Huguenots who are buried there. They will participate in an activity where they will make observations and inferences about a historical person based on the information they attain from the gravestone and the gravestones around them. The activity culminates in a discussion of what the students were able to find out. *Adaptations and modifications can be made for the needs of your class depending on age and ability. Introductory video: This video gives a brief introduction to the Huguenots and why they came to New Paltz. French Church and Burial Ground Activity: Students gain information about the importance and the evolution of the church on Huguenot Street as they are invited into the Old French Church. Each student then has the opportunity to gather a little more information about a particular Huguenot who is buried in the original burial ground for the community. French Portrait Activity: French students are able to utilize their writing, speaking, and listening skills while they participate in a fun and engaging activity that incorporates Historic Huguenot Street’s impressive portraits collection. Quill Writing Activity: Students will have the opportunity to learn how to write with a real quill pen and ink. They will then utilize their newfound writing skills in conjunction with their French language skills to write a pen-pal style letter to a French Huguenot. Wigwam: Students are invited inside our replica wigwam to discuss the Esopus people who lived on this land long before the Huguenots came to New Paltz. Here they will discuss how a wigwam is built, the daily life and practices of the Natives Americans, and the land deed that was signed by the Huguenots and the Esopus. Stone House Tour: When students walk through the door of the Jean Hasbrouck House, they will be transported back to the year 1755, right at the outbreak of the French and Indian War. As students explore this original stone house, they will learn about and contemplate the conflict of cultural identity presented to the French Huguenots living in a culturally diverse and ever-changing community.